From the moment Mosely and his pals stepped up to the microphone and began singing, they realized that they had something very special going on. When Byrnes dubbed the trio The Sojourners the name stuck and – as they say – the rest is history. 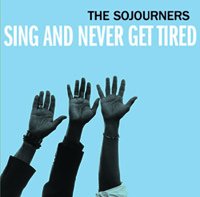 Formative years spent singing in the churches of Marcus Mosely, Will Sanders and Khari McClelland, (from Ralls, Texas, Alexandria, Louisiana and Detroit, Michigan respectively) give The Sojourners' sound an authentic edge that only comes with experience. This is real gospel - blessed with a soul that can't be faked. See The Sojourners' full bio here. and Never Get Tired'. They were also nominated for Blues Recording of the Year. GET ON BOARD ... to donate with PayPal or by credit card to support the new release 'Sing and Never Get Tired, please click on the button. Thank you! On October 15th, The Sojourners officially released their third full length album.The last release, 'The Sojourners', was a great success, garnering a Juno nomination and a Western Canadian Music Award. The new project will continue to serve their core message of social justice and to draw from the inspiration of the quartet and jubilee groups of the 30s and 40s; and of course the ongoing themes of the civil rights movement. Read more about Sing And Never Get Tired here. Purchase Sing And Never Get Tired here.